You may have noticed collagen in your favorite beauty products such as shampoos or body lotions. But most experts agree the real collagen benefits come from taking it internally. Foods like bone broth actually provide a lot of this beneficial protein. What is collagen exactly? Collagen is a hard, fibrous, and insoluble protein considered to be the most abundant protein in the body. In fact, it makes up one-third of the body’s protein, and contains a mixture of amino acids like glycine, proline, glutamine, arginine, and hydroxyproline. Collagen is found exclusively in animal tissue, including connective tissue, bones, muscles, blood vessels, skin, and tendons. When we consume collagen, it helps replace dead skin cells and give the skin elasticity and strength. Studies suggest it’s also great for digestion, joint pain, metabolism, muscle mass, liver health, and heart health. This article explains everything about collagen, including where it comes from, how to consume it, and the many benefits of using it. There are at least 16 different collagen types present within the human body. However, between 80% and 90% consist of types 1, 2, and 3. Different collagen types are also found in certain foods, or are used to create collagen supplements or products. The following is a brief overview of five common types of collagen. Type 1 is the most abundant collagen type in the body, and it contains eosinophilic fibers that form tendons, bones, organs, ligaments, and skin in the body. This collagen also gives skin its elastic and stretchy quality. Collagen type 2 helps build cartilage found in connective tissue, and the joints rely on this collagen to prevent arthritis and joint pain. Type 3 collagen contains reticular fibers and a major portion of the extracellular matrix that makes the skin and organs. It often combines with type 1 to give skin firmness and elasticity. Type 5 collagen is necessary for hair stands, the surface of cells, and placenta tissue. The placenta is the organ that develops in women during pregnancy to provide nutrients and oxygen to the baby. Type 10 collagen is used for forming articular cartilage and new bone. It is also involved in the bone tissue creation process called endochondral ossification. Additionally, this type of collagen benefits synovial joint repair and bone fracture healing. Where do you find collagen? The best way to get it is from the diet, and the best sources come from chicken, beef, egg shell membranes, and fish. You get a large amount collagen when you make broth from beef, poultry, or fish bones, and also egg shells. Here is a brief synopsis of each source. This collagen comes from the bones, muscles, and skin of cows, and is also called bovine collagen. It contains types 1 and 3 collagen, and is full of proline and glycine. It is useful for helping the body make collagen and building muscle. Fish (marine) collagen is very absorbable, and provides mostly type 1 with amino acids like proline, hydroxyproline, and glycine. Marine collagen benefits skin, joints, blood vessels, vital organs, and bones. Cartilage-building type 2 collagen is mostly found in chicken collagen. As a result, chicken collagen is best for joint health due to its glucosamine sulfate and chondroitin sulfate. Most collagen supplements contain chicken collagen. Egg collagen is found in the whites and shells of eggs, and it features mostly type 1, and some type 3, 4, and 10. It contains wound healing and muscle-building nutrients like amino acids, chondroitin sulfate, hyaluronic acid, and glucosamine sulfate. Collagen is loaded with nutrients such as copper, manganese, and vitamin C, but it is known mostly as a “complex protein” food. This primarily due to the 19 different amino acids found in collagen. This includes a combination of essential amino acids and the non-essential or conditional types. Non-essential amino acids are actually very important. Although under normal circumstances they are produced by the body, when you are stressed, sick, or unhealthy, the body may not be able to produce them. The body then needs helps from supplementation or diet. Glycine amounts for about 33% of the protein in collagen. It builds healthy DNA strands, boosts energy during workouts, and promotes muscle growth. About 15% of collagen contains proline, which improves joints, protects blood vessels, and benefits the health. Arginine is responsible for breaking down into nitric oxide in the body, which helps the heart and arteries, and improves circulation and immunity. Often considered the most important and abundant amino acid in the body. Glutamine is obtained from food and created within muscles. It is useful for concentration, digestion, immunity, energy, joint pain, anxiety, tension, and sleep. Collagen is one of the best natural skin care ingredients. A couple of 2014 double-blind, placebo-controlled studies published in the journal Skin Pharmacology and Physiology help confirm collagen hydrolysate benefits on the skin. One study found that collagen hydrolysate improved skin moisture, skin elasticity, and skin roughness and dryness. The other study found that this collagen reduced wrinkles by 20%. Several studies show that collagen benefits joint pain disorders and types of arthritis. A study published in the journal Current Medical Research and Opinion in 2006 found that collagen is effective for osteoarthritis and other joint disorders. Another study published in the International Journal of Medical Sciences in 2009 found that osteoarthritis sufferers treated with type 2 collagen showed enhancement in daily activities like walking up the stairs. Other studies show that type 2 collagen helps reduce joint swelling in rheumatoid arthritis patients. A study published in the Journal of Investigative Dermatology in 2015 suggests that collagen is a potential treatment for hair loss and other skin-related conditions. Collagen has also been studied for a variety of other reasons. Below are some additional health benefits of collagen that you should keep in mind. Collagen helps break down proteins and soothes the gut lining, and also heals damaged cell walls with amino acids. It also helps form connective tissue, which helps heal the protective gastrointestinal tract lining. As a result, studies indicate collagen is useful for treating irritable bowel syndrome, acid reflux, and leaky gut syndrome. Studies have also found that collagen is low in patients with inflammatory bowel disease, such as ulcerative colitis and Crohn’s disease. More collagen in the diet may help increase metabolism by helping with nutrient conversion and adding lean muscle mass to the body. The glycine in collagen also plays form muscle tissue through the conversion of glucose into energy. Studies also show that glycine is important for the central nervous and digestive system, which play a major role in overall health. Arginine also boosts the body’s ability to make protein from other amino acids. This is vital for muscle tissue repair, boosting metabolism, and proper growth and development. Collagen benefits the liver as well. The glycine in collagen helps reduce liver damage when the glycine absorbs toxins, alcohol, or other foreign substances. A three-day bone broth cleanse is a great way to detox your liver and repair leaky gut. This helps reset gut and improve the immune system. A study published in the European Review for Medical and Pharmacological Sciences in 2012 found that glycine can help decrease alcohol-induced liver damage, and other chronic or acute forms of liver injury. The amino acid proline in collagen helps artery walls release fat buildup from the bloodstream, repair tissue within the arties, and control blood pressure. Proline is also associated with arteriosclerosis prevention because the amino acid gets plaque from building in the arteries. Nitric oxide production also uses the arginine in collagen. This is useful for vasodilation, which is a process widens arteries, relaxes blood vessels and muscle cells, and improves circulation. Want to know how to use collagen? As the article already indicates, collagen comes from animal sources, which means collagen supplements cannot be vegetarian or vegan. An excellent source of dietary collagen is making and drinking real bone broth. You can consume it alone or in soup recipes or other recipes that call for broth. I suggest taking the time to make a bone broth. All you need is a large stockpot, bones, and filtered water. I also use some vegetables like carrots, onions, and celery, and apple cider vinegar to make the nutrients from the broth more available. You can also take collagen supplements, like collagen protein powder that often contains chicken collagen. It is a good idea to get collagen powder from pasture-raised and grass-fed cows without antibiotics or other chemicals. Eating a whole foods and well-balanced diet will also help increase collagen absorption from the sources you consume. You can mix collagen supplements into soups, smoothies, and baked goods. 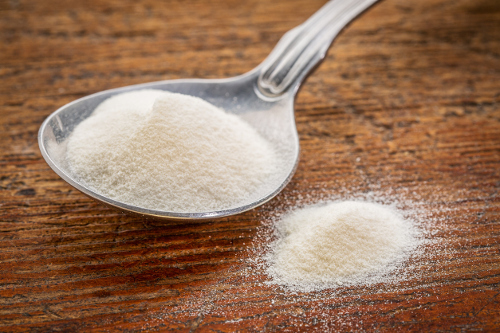 Collagen can be very useful for skin, hair, joint, heart, digestive health, and more. Topical collagen powders and creams often contain molecules too large for the skin to absorb; therefore, you are slathering collagen on your skin with minimal benefits. A better idea is to use collagen supplements or bone broths made from beef, poultry, fish, or eggs. This way will also save you money! McIntosh, J., “What is collagen? What does collagen do?” Medical News Today; http://www.medicalnewstoday.com/articles/262881.php, last updated Aug. 5, 2015. Wells, K., “Benefits of Collagen for Skin and Hair,” Wellness Mama; https://wellnessmama.com/60867/benefits-of-collagen/, last updated March 29, 2017. “Collagen,” Herbwisdom; http://www.herbwisdom.com/herb-collagen.html, last accessed April 6, 2017. “6 Surprising Benefits of Collagen PLUS Why, When & How to Take It For Best Results!” Primally Inspired; http://www.primallyinspired.com/benefits-of-collagen-peptides-protein/, last accessed April 6, 2017. Chen, P., “Lack of collagen VI Promotes Wound-Induced Hair Growth,” Journal of Investigative Dermatology, October 2015; 135(10): 2358-2367, doi: 10.1038/jid.2015.187. Bello, A.E., “Collagen hydrolysate for the treatment of osteoarthritis and other joint disorders: a review of the literature,” Current Medical Research and Opinion, November 2006; 22(11): 2221-2232. https://www.ncbi.nlm.nih.gov/pubmed/17076983. Crowley, D.C., et al., “Safety and efficacy of undenatured type II collagen in the treatment of osteoarthritis of the knee: a clinical trial,” International Journal of Medical Sciences, 2009; 6(6): 312-321. https://www.ncbi.nlm.nih.gov/pmc/articles/PMC2764342/. Trentham, D.E., et al., “Effects of oral administration of type II collagen on rheumatoid arthritis,” Science, Sept. 24, 1993; 261(5129): 1727-1730. https://www.ncbi.nlm.nih.gov/pubmed/8378772. Proksch, E., et al., “Oral supplementation of specific collagen peptides has beneficial effects on human skin physiology: a double-blind, placebo-controlled study,” Skin Pharmacology and Physiology, 2014; 27(1): 47-55, doi: 10.1159/000351376. Proksch, E., et al., “Oral intake of specific bioactive collagen peptides reduces skin wrinkles and increases dermal matrix synthesis,” Skin Pharmacology and Physiology, 2014; 27(3): 113-119, doi: 1159/000355523. Koutroubakis, I.E., et al., “Serum Laminin and collagen IV in inflammatory bowel disease,” Journal of Clinical Pathology, November 2003; 56(11): 817-820. https://www.ncbi.nlm.nih.gov/pubmed/14600124. Barakat, H.A., et al., “Glycine alleviates liver injury induced by deficiency in methionine and or choline in rats,” European Review for Medical and Pharmacological Sciences, June 2012; 16(6): 728-736. https://www.ncbi.nlm.nih.gov/pubmed/22913202.